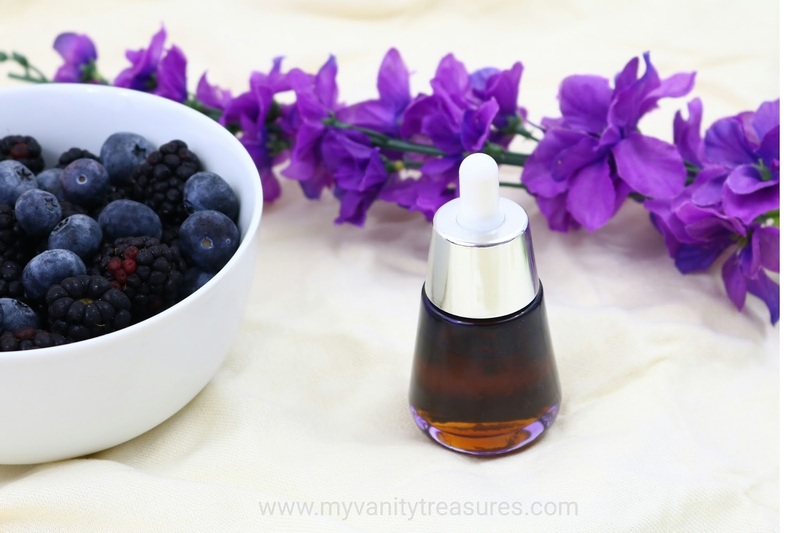 If you have been following me on Instagram (which you should as I share my daily morning and evening skincare routines there plus a lot of extra stuff) this post would not come as a surprise to you, as you have seen me mention this oil several times in my skincare routine in past several weeks! Face oils have come a long way. I remember when I started using oils as moisturizer 3-4 yrs back the only oils I could find were the Vit E from The Body Shop and Clarins Facial Oils, latter being my favourite for past several years and you can find the detailed review here. Today every skincare brand has their version of a face oil or serum. There are so many options available in the market that it can be overwhelming especially if you are new to skincare. It is very important to know which oils work for your skin and for that one must first understand the needs/demands of their skin and what exactly are you looking for in terms of benefits. For eg if you are looking for oils which are high in antioxidants or Vit C or anti-ageing or you want something more clarifying if you have issues with congestion and acne etc. Personally for me it all comes down to the ingredients as well as the knowledge and experience of the creator of the product. I therefore like to invest in indie brands where I can connect with the owners/creators of the brand and get to know their thought process behind a particular product. One such DIY queen and skincare expert is Chel from Holy Snails blog, if you have been following her you know all about her DIY creations! Not long ago she opened her webstore where she started selling her own DIY formula's after testing them for months! Her products are hand crafted by herself using high quality ingredients and backed up with science! Perfect! One of her creations is Perseids Oil. I was looking for a new face oil and one look at the ingredients list I knew I had to try it asap! Ordered right away and have been using it over a month now! Perseids Oil is a facial oil blend rich in antioxidants and the perfect defense for your skin this winter. Aside from the many delicious fruit and nut oils, it also includes Tocopherol (Vitamin E), Bisabolol (anti-irritant/anti-inflammatory), and Squalane (emollient). How to use: This can be used on its own in place of or in addition to your favorite moisturizer. You can also add a drop or two into a serum, cream, or foundation. If you are using other Holy Snails products, the product layering order would be Snowbang Essence -> Shark Sauce -> Perseids Oil. Suitable for: All skin types, although those with oily skin might want to consider a sample sized bottle first to see if it is too heavy. Warnings: Please always patch test any new products. Perseids Oil contains many fruit and nut oils, so please check the ingredients list if you have known allergies. This product does not cause purging, so if you experience breakouts or irritation, please discontinue use. This product does not contain any photosensitizing ingredients, but the most vital and effective anti-aging step in your routine will always be sunscreen. Please always use (the correct amount of) sunscreen for best results in fading hyperpigmentation. Notes: This product is not intended to diagnose, treat, cure, or prevent disease. Always consult with your professional skin care provider. It does NOT have any fragrances, so there will be a slight smell. No returns or exchanges will be offered, so please consider this before purchasing. As I mentioned above, I have been using this oil for over a month now and to tell you the short version I absolutely love it! It comes in a gorgeous dark maroon purplish glass bottle with a pipette. Its simplicity at its best! I really don't have any issues with the packaging, although I hope she includes the description and ingredient list on the bottle itself, not a showstopper but definitely something to consider. The oil itself is dark yellow in color as you can see in the picture below. 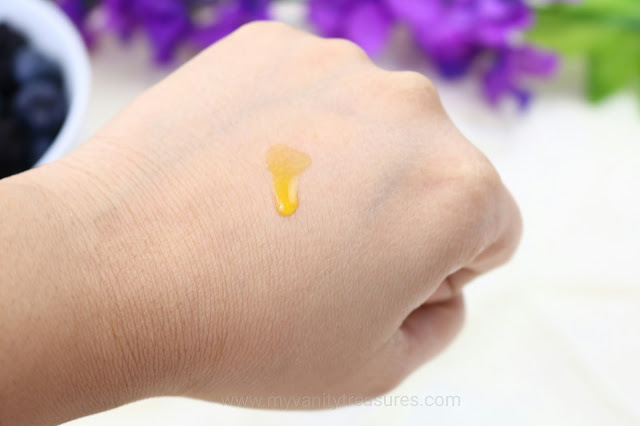 The consistency is very light weight so all skin types can use this oil. I honestly was shocked the first day I tried as it got absorbed in matter of seconds! No oily residue left behind! My skin just drank up all the oil leaving behind a soft glow..love it! I use it every single night and wake up to well hydrated glowing skin in the morning. It does not clog my pores or has caused any breakouts. You can use it in the mornings well if you have extremely dry skin, for me personally since I have combination skin I dont feel the need to use oils in mornings but if my skin feeling is feeling parched or irritated I will use this oil and immediately it soothes my skin down. 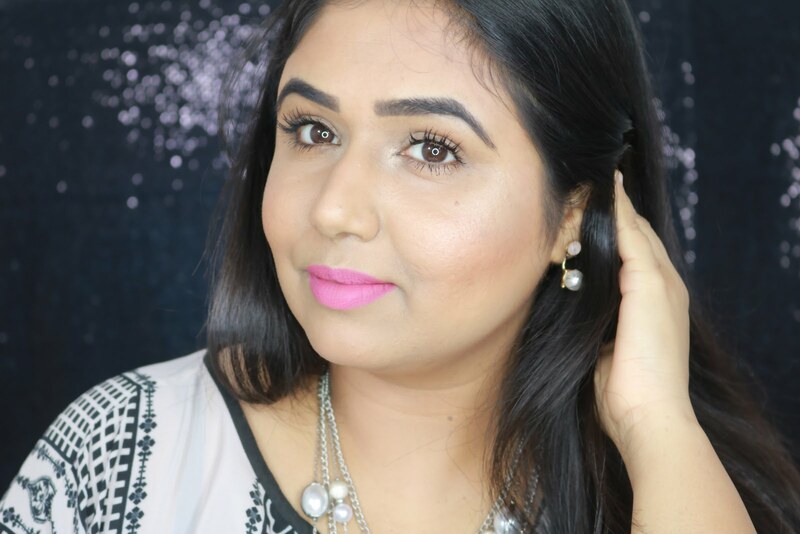 One important tip - Spritz your face with water/rose water/favorite toner before applying the oil. If you have issues with oil not getting absorbed properly, try this trick and you'll see a world of difference! Not only your skin will absorb the oil but the oil will penetrate deeper in your skin! Lets see some of the super ingredients present in this oil! Avocado Oil - Rich in Oleic acid hence makes it perfect for dry , dehydrated and mature skin, it also has essential fatty acids and Vit A and E.
Borage Seed Oil - Contains GLA - Gamma-Linolenic Acid, it has anti-inflammatory effects. 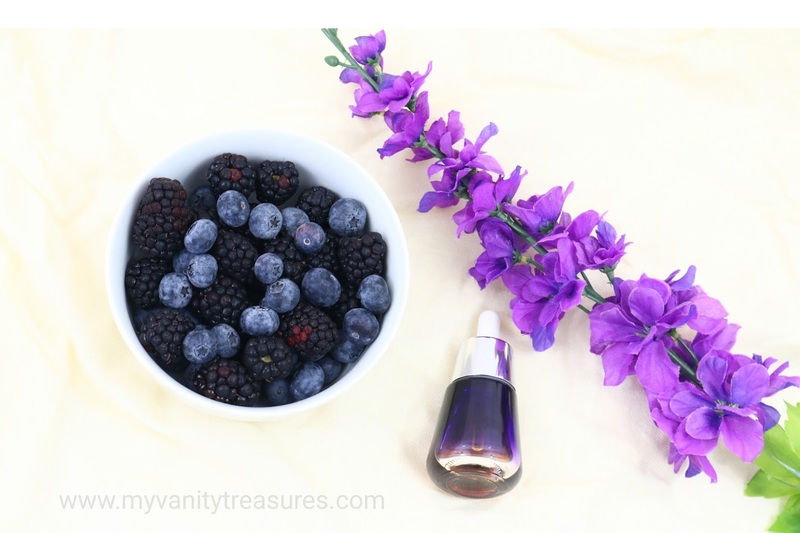 Blackberry Seed Oil - Highly stable source of vitamin C; helps even skintone and support natural collagen. 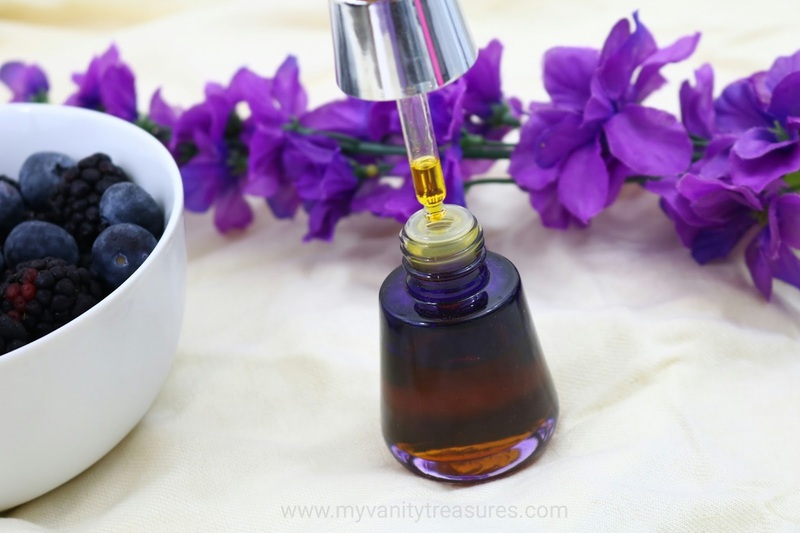 Blueberry Seed Oil - Contains extremely high antioxidant, vitamin E, and omega 3 levels; provides a three-pronged defense against premature aging. Cranberry Seed Oil - Contains a perfect balance of omega 3-6-9, and vitamins A, C, E, and K; aids in the skin's absorption of essential fatty acids for ultimate regeneration; may enhance UV protection. Red Raspberry Seed Oil - Anti-inflammatory action helps with the effects of eczema and premature aging; provides broad-spectrum, anti-UV qualities to complement (not replace) sunscreens. Pomegranate Seed Oil - Rich in omega-5, a unique fatty acid, as well as anti-oxidants and phytosterols. When I was going through the ingredient list of Perseids Oil, it oddly felt familiar, little research later I found the ingredients to be quite similar to Sunday Riley Juno Hydroactive Cellular Face Oil! I don't own a full size of Juno but I have tried a sample and remember liking it but at that time the price of 90$ for 30ml seemed too high! Below are the ingredient list for both, see yourself! The ones in bold are common in both the oils. Sunday Riley Juno Oil - Juno Organic Superfood Seed Oil Blend [Rubus Fruticosus (Blackberry) Seed Oil, Vaccinium Corymbosum (Blueberry) Seed Oil, Vaccinium Macrocarpon (Cranberry) Seed Oil, Rubus Idaeus (Red Raspberry) Seed Oil, Vitis Vinifera (Chardonnay Grape) Seed Oil, Daucus Carota Sativa (Wild Carrot) Seed Oil, Nigella Sativa (Black Cumin) Seed Oil, Brassica Oleracea Italica (Broccoli) Seed Oil], Limnanthes Alba (Meadowfoam) Seed Oil. By analysing you can see that Sunday Riley's Juno Superfood Seed Oil Blend (Blackberry+Cranberry+Red Raspberry+Blueberry) is also present in the Perseids oil along with a ton of other beneficial oils! Please note this does not mean that Perseids Oil is exact dupe or better oil than Sunday Riley Juno! I incorporated this comparison in this post so that all those out who are looking for an affordable version of Sunday Riley Juno Oil can benefit and have other options like Perseids Oil. I have tried a sample of Juno and remember quite liking it, in texture if I remember correctly Juno absorbed pretty well and for me personally I get the same results from Perseids Oil which is literally 1/3 the price of Juno! Again that does not mean Juno is bad but only that you don't have to break a bank to get a face oil which is rich in antioxidants, omegas and vitamins! Price :- 30$ for 30ml, Chel also sells 7ml samples if you'd like to give a test drive! I hope the review and comparison were helpful, if you have any questions please do leave them in the comments section below and I will get back to you asap!